A performance full of commitment and for most of the game of high quality, saw the Albion bring home the biggest trophy they’ve ever seen, never mind won, from Oxford on Wednesday, August 7. The match at the Manor Ground was for the Oxfordshire Benevolent Cup. There was certainly nothing benevolent about the approach of both sides, and the game was a thriller. An early injury to Eric Young, when the elbow of Jeremy Charles caught him in the face, upset Albion’s rhythm for a while. Jacobs moved back into the defence, and Penney came on to play on the right of midfield. Once they settled again Albion started to play well, and a great goal from Dennis Mortimer just before half-time put them in front. Midway through the second-half a scuffle between John Aldridge of Oxford and Albion’s Steve Jacobs, saw both players sent off by referee Hedges, and there could be little argument about the decision, although it was clear that Aldridge’s kick on Jacobs started the trouble. Seconds from time Gary Briggs netted the equaliser. Albion protested that Briggs, Charles and Shotton had all bundled into the unfortunate Perry Digweed, but the goal stood. It had been decided to use penalties as a tie break. Albion took the first kick through Danny Wilson. Alan Biley and Justin Fashanu had little difficulty in beating Hardwick with theirs, but it took Steve Penney two efforts to make his count when the ‘keeper moved to save. Dennis Mortimer completed a ‘five out of five’. Oxford’s first four all counted, but a marvellous save by Perry Digweed from Andy Thomas gave Albion the trophy. 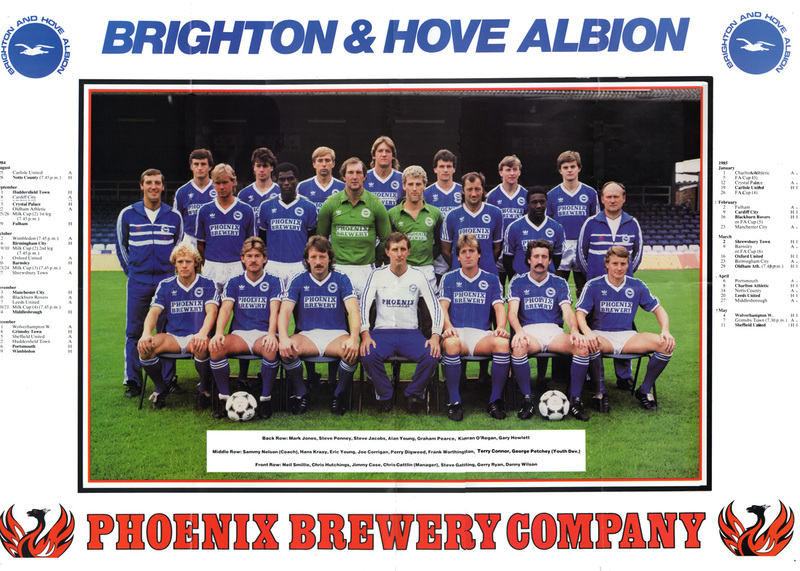 Here’s Chris Cattlin’s formidable Albion squad ahead of the 1984/85 season. Having beaten Liverpool the season before, the Seagulls had cup pedigree and feared no-one in a knockout competition. 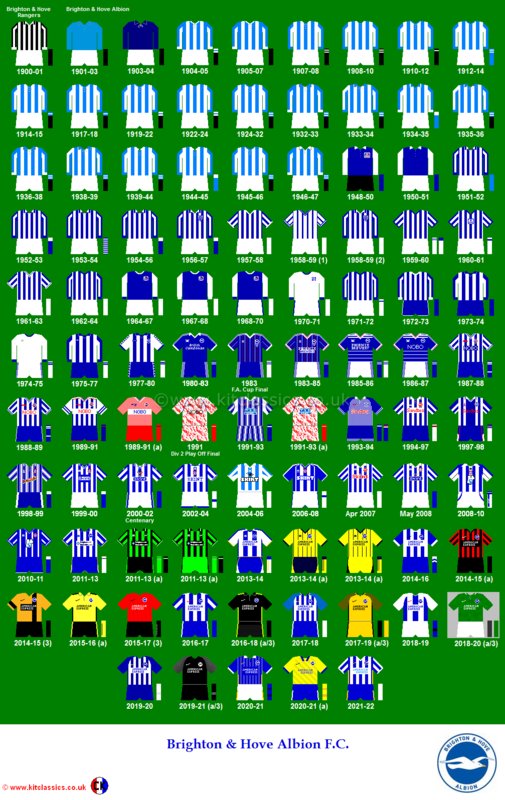 When Brighton drew Hull City in the FA Cup in both 1984/85 and 1985/86, they achieved satisfying victories in both encounters. 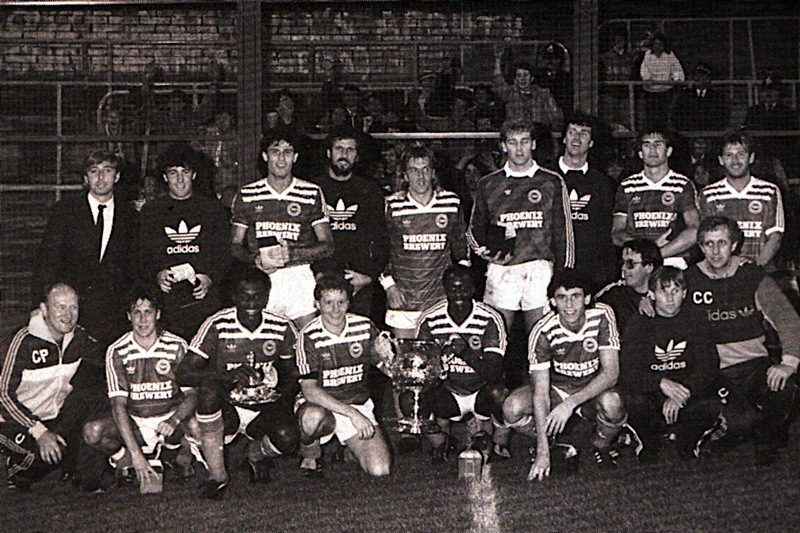 However, it could not paper over the fact that the Tigers, led by player-boss Brian Horton, were set to surpass the Albion in the League. “I would like to welcome Brian Horton and his team. He and I have many happy memories of our days together with the Albion both on and off the field. I know he will be particularly keen to do well against his old club, but he will certainly remember his happy days at the Goldstone. By the end of the season, while Albion narrowly missed out on returning to the top flight, Hull City had succeeded in clinching promotion from the Third Division. When the sides met in the Second Division in 1985/86, goals from Connor, Wilson and Fashanu firmly put the new boys in their place, as Hull crashed 3-1 at the Goldstone in November 1985. In the FA Cup, in January, in the Fourth Round at Boothferry Park, Albion prevailed again. A Cup Indian sign, perhaps? Or maybe a home jinx, seeing as Hull have not beaten Albion away to this day since 1965. On 25th January 1986, Dean Saunders and Terry Connor (2) scored the goals to take Albion through in a 3-2 victory. 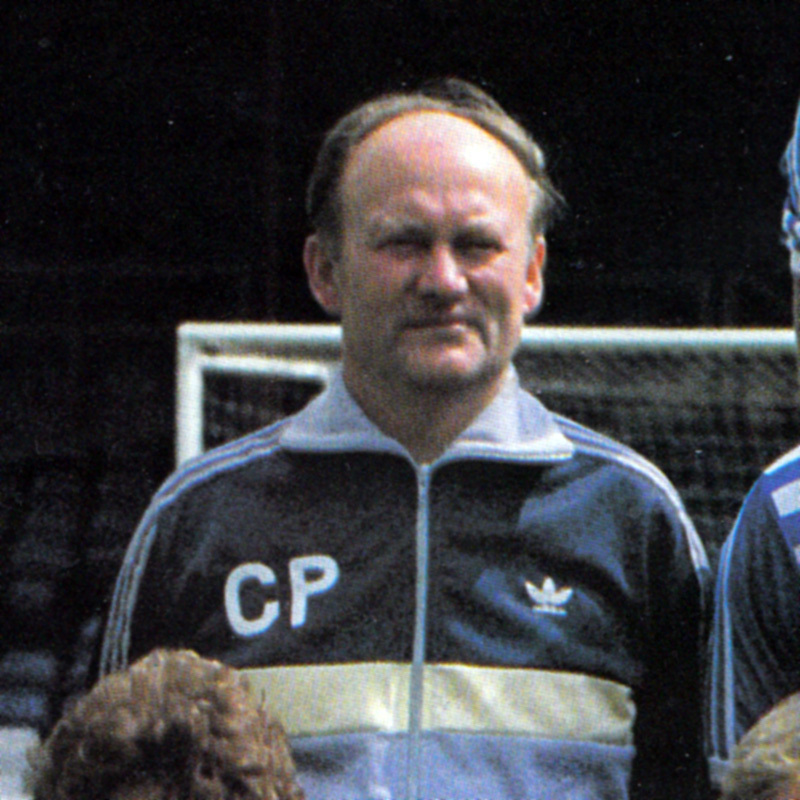 The rapidly improving Hull City did get revenge in the League, however, beating Albion on the last day of the season, and pushing up to sixth position, five places above the fading Seagulls, now managed on a temporary basis by assistant George Petchey (below), after Cattlin had been given the sack days before. You may be interested in reading an interview of Andy Rollings by me in the current Viva Brighton magazine (January / February 2014). Nobody in authority seemed to have a clear view. Suddenly, Rollings was lying on the ground and then taken off holding his nose. A clue was spotted by Albion’s club doctor, Herzl Sless. 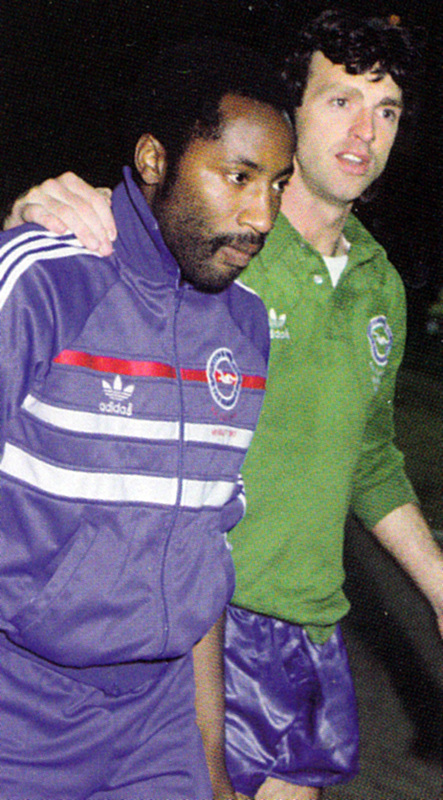 He later asked (referee) Daniels if he had spotted a large signet ring Fashanu was wearing. In Sless’s opinion, the ring should have been taken off before the start or covered by a protective tape. Daniels said it had gone unnoticed and thanked Sless for his observation. The piece worn by Fashanu was likened to a knuckleduster and could easily have accounted for the injury to Rollings’ nose. Rollings left for Swindon at the end of the 1979/80 season before turning out for Portsmouth, Torquay, Brentford and Maidstone. I saw Norman Whiteside about 12 years after (the Final) at a PFA do and we had a good laugh about it (Whiteside’s foul). We exchanged autographs and he wrote on my card ‘You went in high but I went in higher!’ To be fair he says in his book that he never intentionally went out to hurt anyone in his career, and that the only person he actually ended up hurting was me. At the end of the day neither of us were angels, were we? I had my moments- I had a lot of moments come to think of it (Chris was sent off five times during his Albion career)! They were different times and the game was a lot more physical then, so those things used to happen unfortunately. I suppose it’s not that surprising Ramsey was so relaxed about it. Off the field, he certainly knew how to chill out. Here he is listening to reggae music on his Sony Walkman! Just like FKS by the early 1980s, Topps was on the decline. The chewing gum firm’s garish bubblegum cards were a big part of many childhood memories from the 1970s, but its position was now under increasing threat. 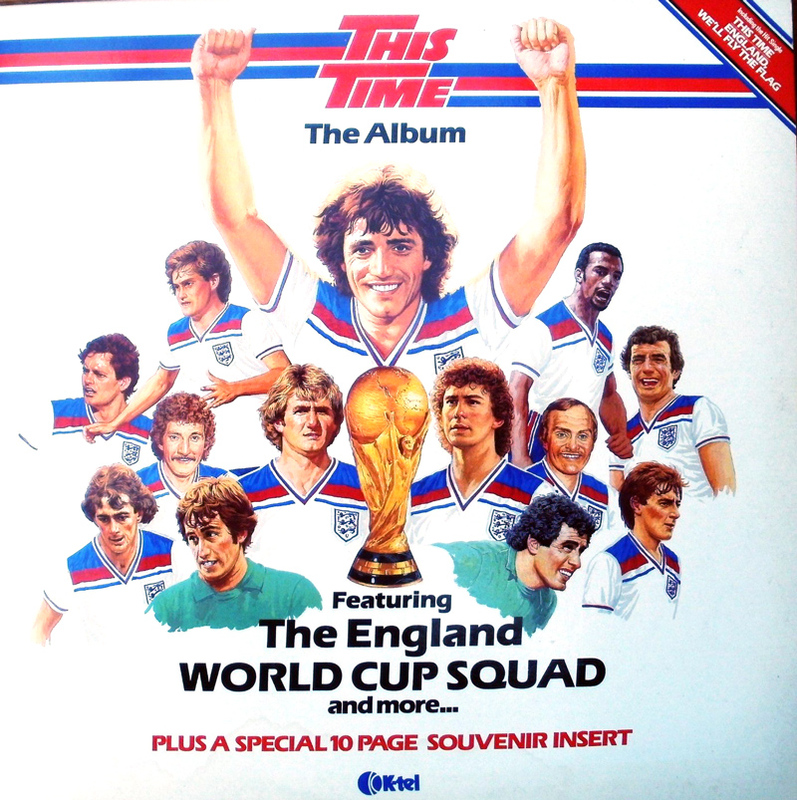 It was certainly slow get in on the sticker market that Panini was sewing up. In addition, perhaps Topps had also over-stretched itself trying to cover the whole of the Football League rather than focus on the more lucrative First Division. 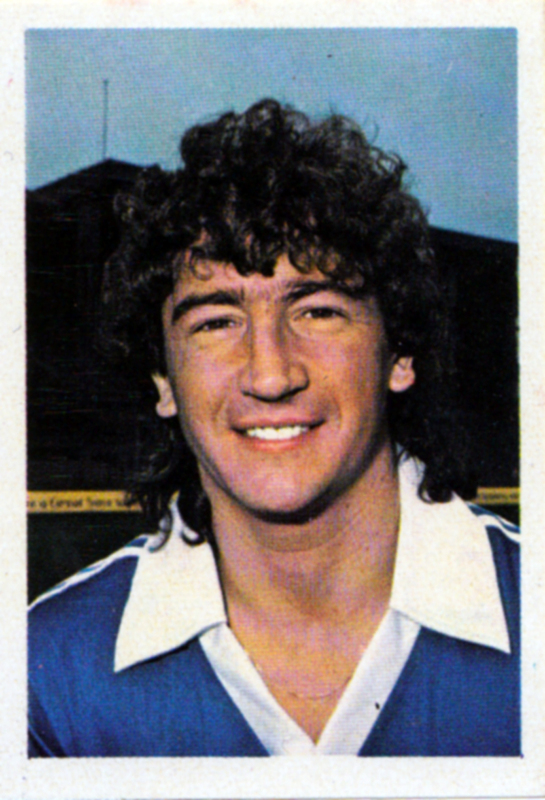 For instance, in 1978/79, it had rather delightfully issued eight playing card-sized ones for Brighton & Hove Albion, who were still a Second Division side. Although, for that, I will always retain a soft spot for Topps! As you can see, all cards were now shrunk to cigarette card size. 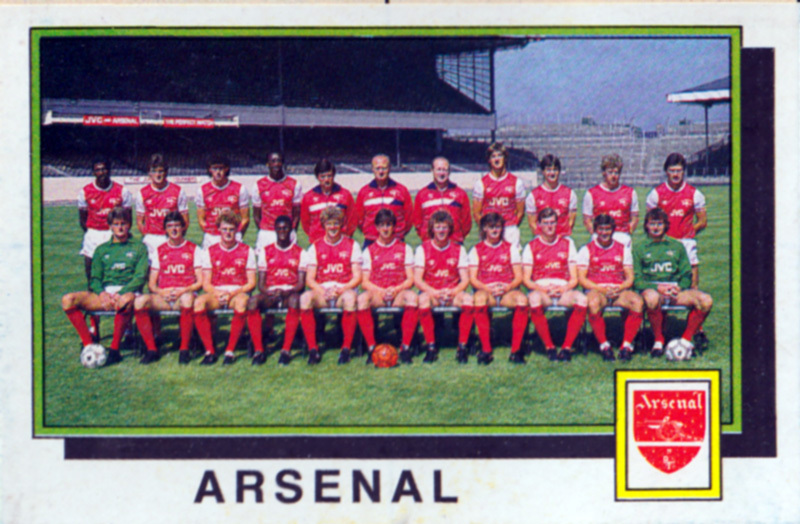 If you were a supporter of Arsenal, champions Aston Villa, Ipswich, Liverpool or Manchester United, you were given a full page of eleven player cards of your favourite side to stick in. It’s a lovely feeling to be filled with expectation about a new edition of a magazine that’s about to hit the newsstands. I don’t know about you, but football-wise, I haven’t felt this way since 90 Minutes magazine died a death in the 1990s and Tuesday mornings were never quite the same again. 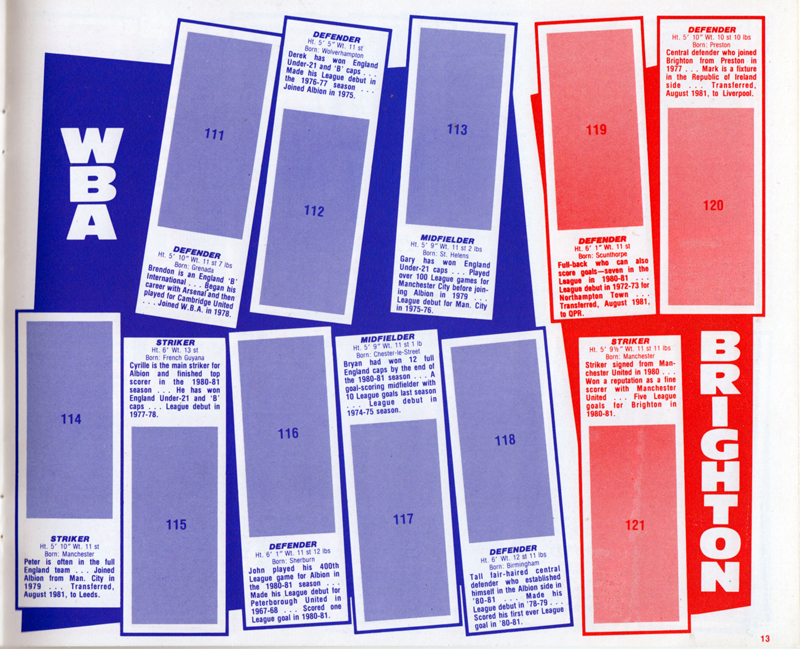 In a previous post, I have documented the excellent coverage Brighton & Hove Albion has received in past issues. 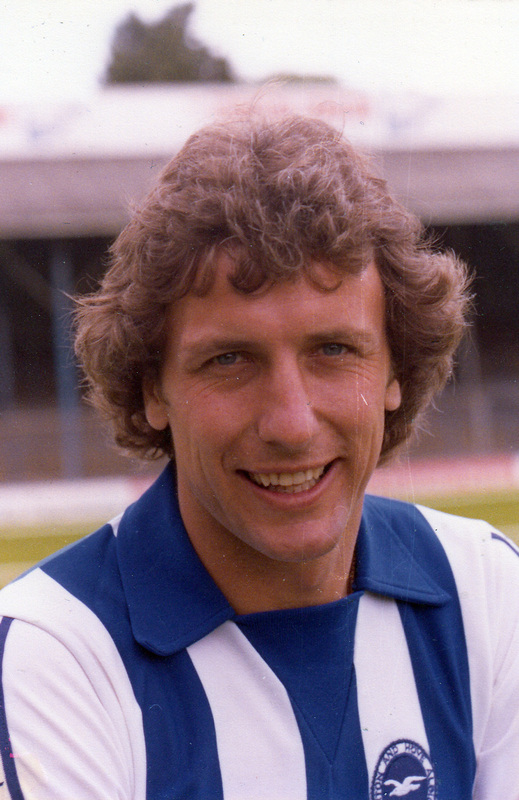 However, Albion fans didn’t get much of a chance to see him in it as he was an unused substitute on the opening day of the 1980/81 season against Wolves and made no further appearances for the first team before departing for Preston. I ended up in the reserves even though I was playing well. I got asked to go to Newcastle but failed the medical. The club then had an opportunity to sell me to Preston and they perhaps felt they needed to offload some players. Maybe I should have dug my heels in and fought. c) His manager at Nottingham Forest, Brian Clough, and his brother John were far from supportive. were somehow all linked and that coming out as gay led to his death as be became ostracised from the football community. 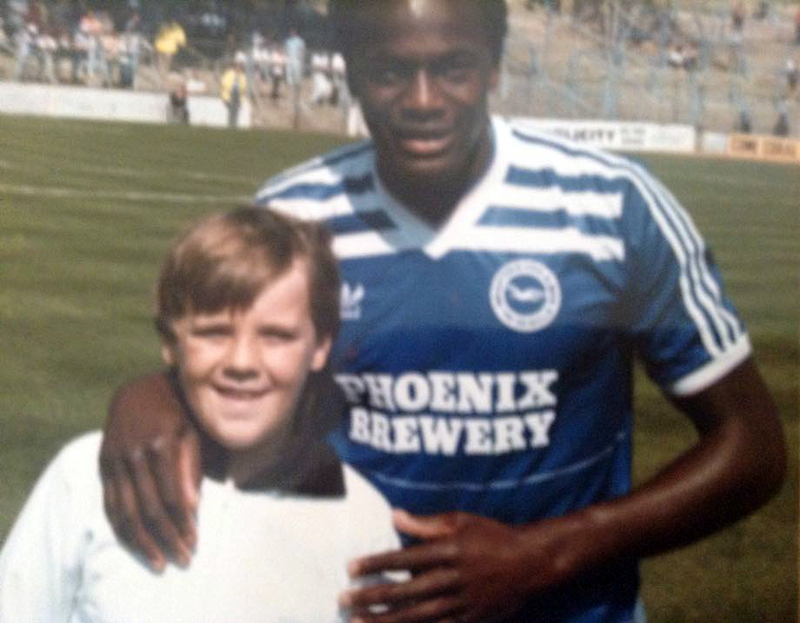 The details of Fashanu’s life, especially his struggle with injury (he actually retired from the professional game when he was released by Brighton) and his particularly brand of religion, not to mention the varying social values of football fans and players, show that things were far more complicated than that. Spencer Vignes writes a splendid piece about ‘football specials’, the trains that carried the team and supporters to away matches in the 1970s and 1980s. 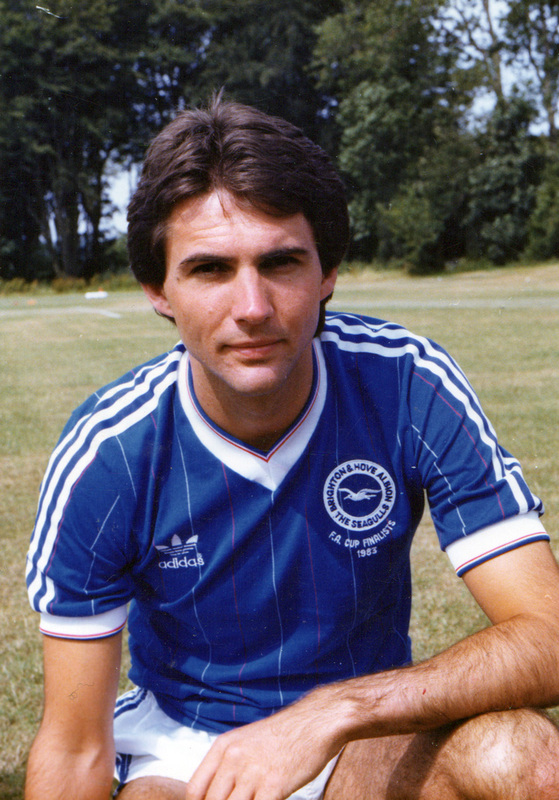 He mentions the Seagulls Specials and there is a lovely quote from Mark Lawrenson about the party on the train after Brighton clinched promotion to Division One with a 3-1 win at Newcastle. “We travelled home by train and The Seagull Special became The Paralytic Express. There was champagne everywhere. The journey back seemed to take a lifetime, but nobody cared. I walked the length of the train with the team, thanking the fans for their support. Everyone who was on that train will remember it forever. 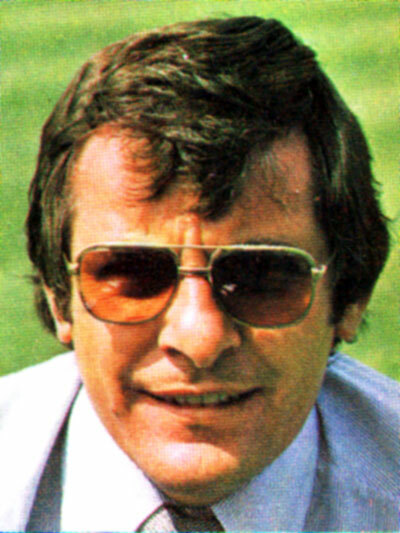 Presenter Alan Mullery is also the ‘star’ of a low budget video nasty reviewed by Chris O from the Football Attic. Finally, the magazine also charts the fall and heartwarming rise of Newport County, Brighton & Hove Albion’s League Cup opponents on Tuesday evening. So, if this has whetted your appetite, feel free to nip off to the newsagent now. 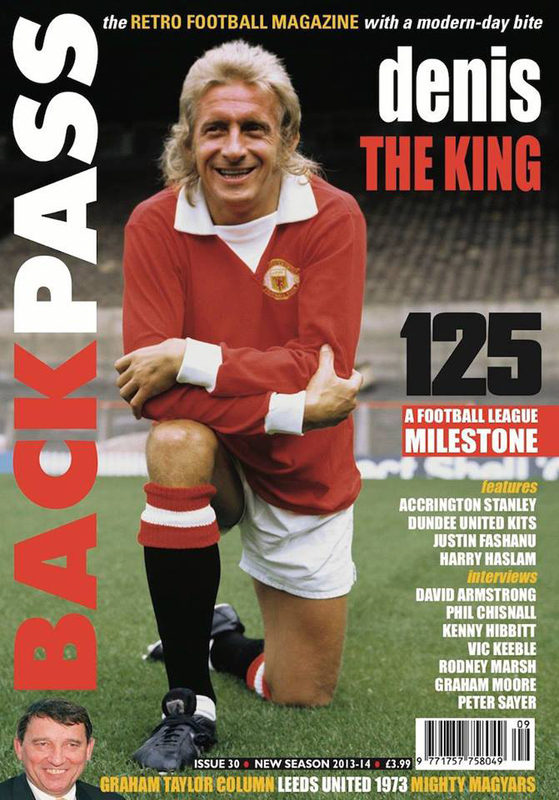 Or subscribe online via www.backpassmagazine.co.uk. Just £3.99. 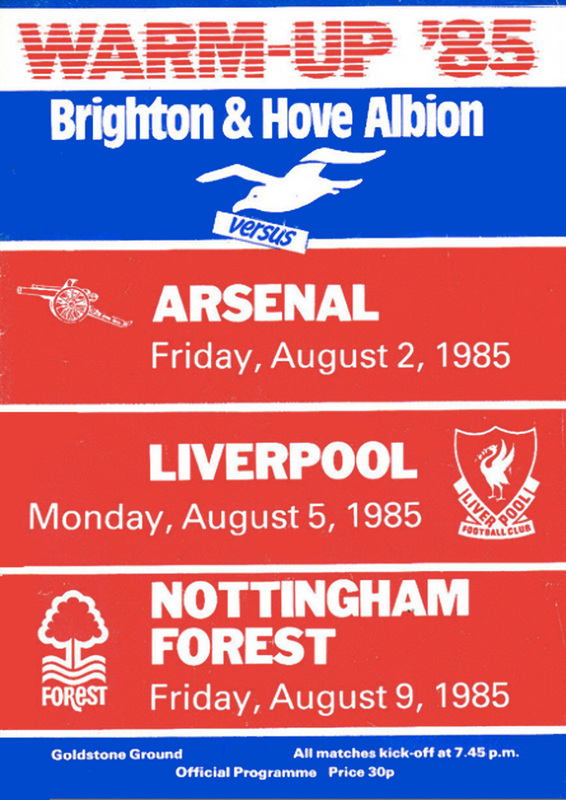 A mouth-watering pre-season programme in the summer of 1985 saw First Division giants Arsenal, Liverpool and Nottingham Forest make the journey to the South Coast. The first home game was against Arsenal on Friday August 2. A full-strength Gunners side came to the Goldstone, and among their substitutes was Martin Keown who is now back at the Goldstone on loan. Albion played with the wind and rain behind them in the first-half, and took the lead with a cracking goal from Dennis Mortimer. The former Villa man certainly looked the part when he gave John Lukic no chance in the Arsenal goal. 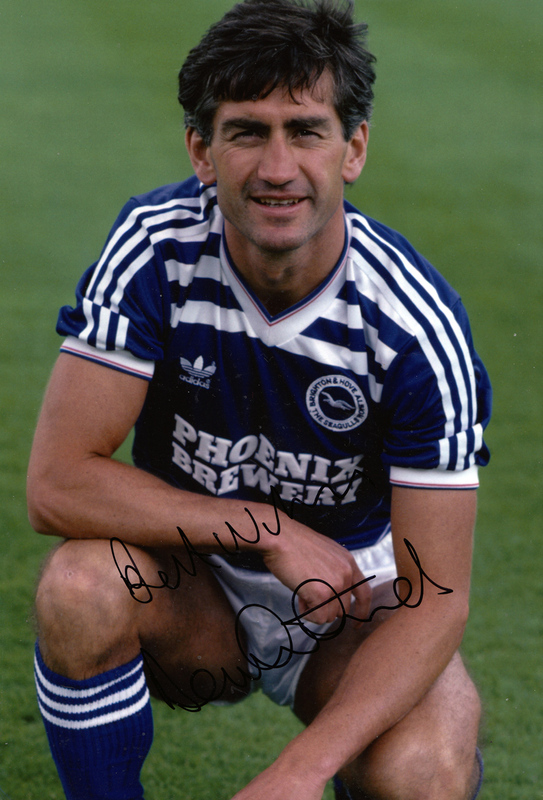 A defensive slip that saw Graham Moseley stranded gave Paul Mariner a simple chance to put Arsenal level, and a header from Stewart Robson provided the winner for the Londoners after the interval. They might have netted a third, but Charlie Nicholas missed from the spot after Eric Young had been penalised. The biggest pre-season crowd turned out for the game with Liverpool on Monday, August 5. 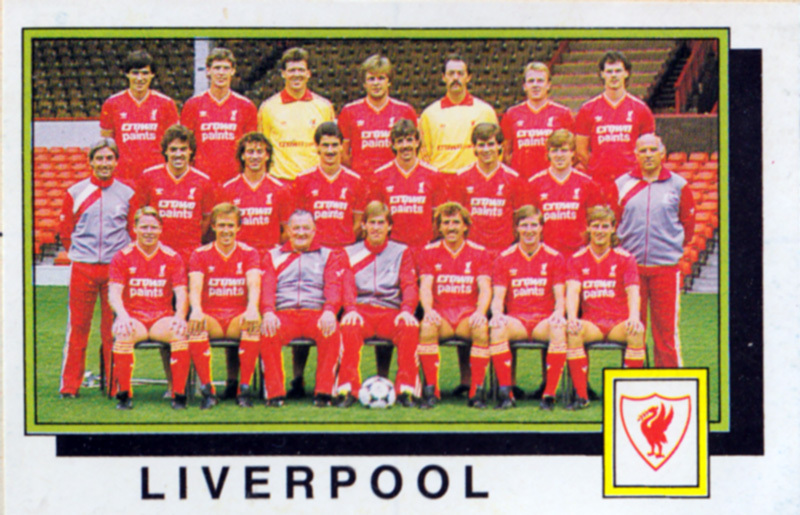 With new manager Kenny Dalglish also in action as a player, it was a full strength Liverpool side that was looking for revenge against the club that had, twice in three seasons, knocked them out of the FA Cup. It took Liverpool just seven minutes to take the lead, with Dalglish playing a 1-2 with the Dane Jan Molby, before slotting home from some eight yards. Molby was also involved in the second goal. A precision pass set Steve Nicol away on the right, and he made no mistake. Before the interval it was perhaps predictable that Ian Rush would find the net. Dalglish took advantage of defensive hesitation, Rush showed typical perception and nodded in from only two yards out to score a third for Liverpool. The fourth too came from Rush, once again Dalglish was the architect, and the Welsh striker found space-a-plenty in the Albion area. Albion scored a late goal through Steve Jacobs, by now pushing forward in midfield, but by then Liverpool had shown that they will once again be among the best this season. Albion reserved their best for last Friday at the Goldstone when they walloped First Division Nottingham Forest 5-2. 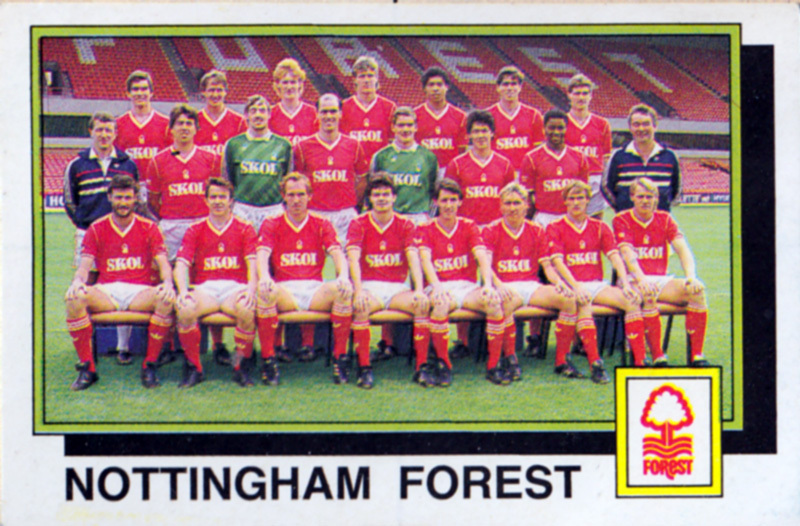 The match was a real thriller for the fans, and no one except perhaps for Brian Clough and his team, went home unhappy. 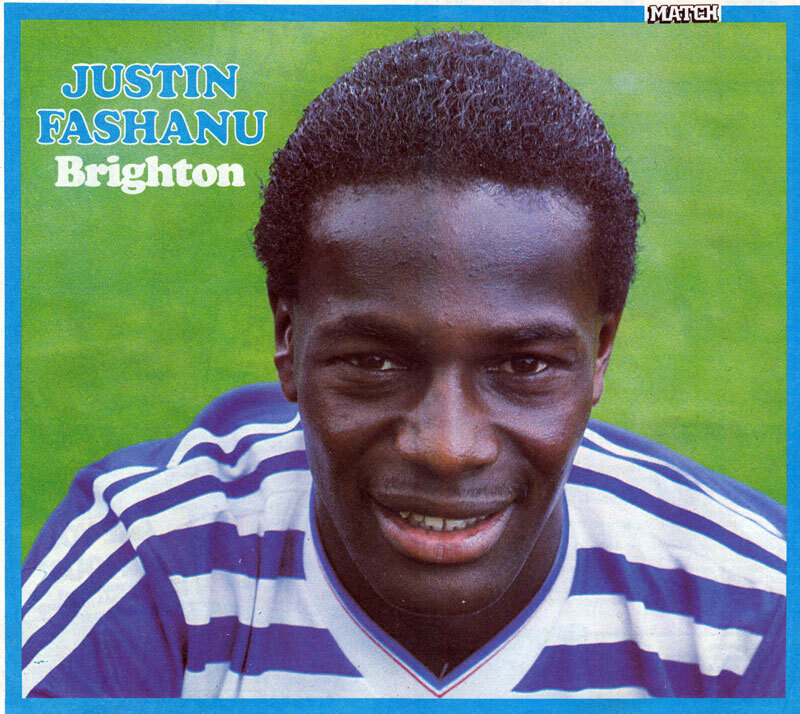 Justin Fashanu had an outstanding game against his former team mates. Enforced changes had to be made in Albion’s side. Christ Cattlin had signed 22 year-old defender Gavin Oliver on loan from Sheffield Wednesday. He filled the number five shirt. Albion took the lead when a short corner gave Mortimer the chance to cross from the right and Biley headed in. That provided the only goal of the first-half. The second 45 minutes was a real thriller. 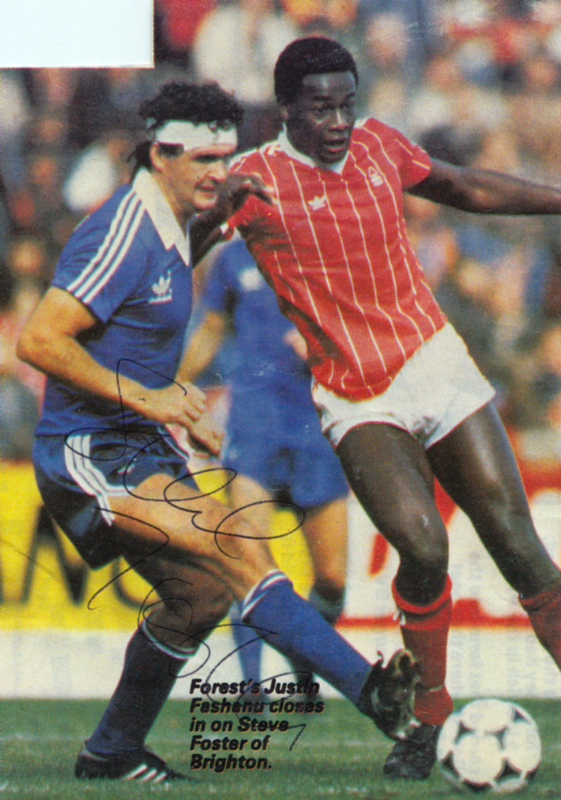 Steve Hodge put Forest level after the Albion defence had been caught napping. 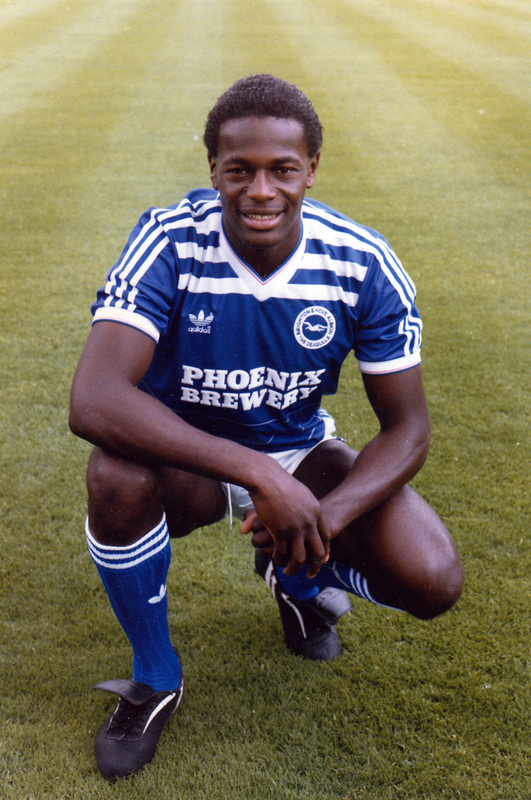 Albion were soon back in front when Steve Jacobs crashed the ball in, after Fashanu had nodded on a right-wing corner. The joy was short-lived when an error by Perry Digweed presented Nigel Clough with a ‘sitter’. The finale from Albion surely left the Goldstone regulars with an appetite for more. First Martin Keown pushed forward. His run produced a corner which Mortimer floated in, Fashanu’s header caused havoc and Dean Saunders provided the finishing touch. Danny Wilson grabbed the goal he certainly deserve when Fashanu again provided an important touch, not to mention distraction to the visiting defence, and the final goal came from just about the most powerful shot seen at the Goldstone for years. 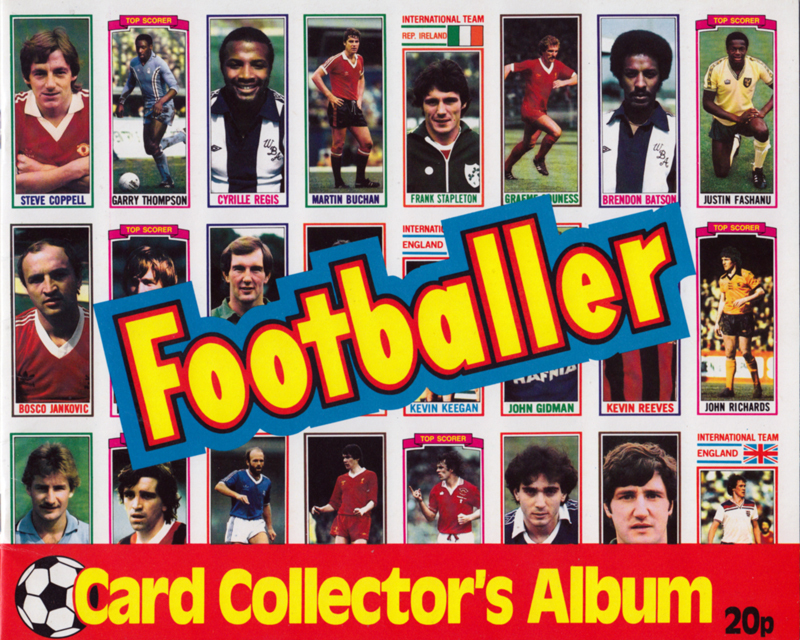 Fashanu connected from 15 years out. Segers could only parry the ball, and O’Reilly tapped it over the line. While Chris Cattlin gave his team guarded praise in the press room after the match, Brian Clough declined to be interviewed. The praise from Cattlin was well justified, and the performance of his team has surely whetted the appetite of supporters, to kindle that feeling of anticipation of an enjoyable and productive season ahead. “At 24, the born-again Christian has put a controversial past behind him, and following a £110,000 move from Notts County in June, he is already a hit with the fans. They love his power and skill, and Cattlin has opted for a front duo of Fashanu and Alan Biley, the £50,000 buy from Portsmouth late last season. Unfortunately for the muscular striker, his Brighton career was only four games old when he was sent off for the third time in a year during the club’s recent 2-1 home win over Bradford. 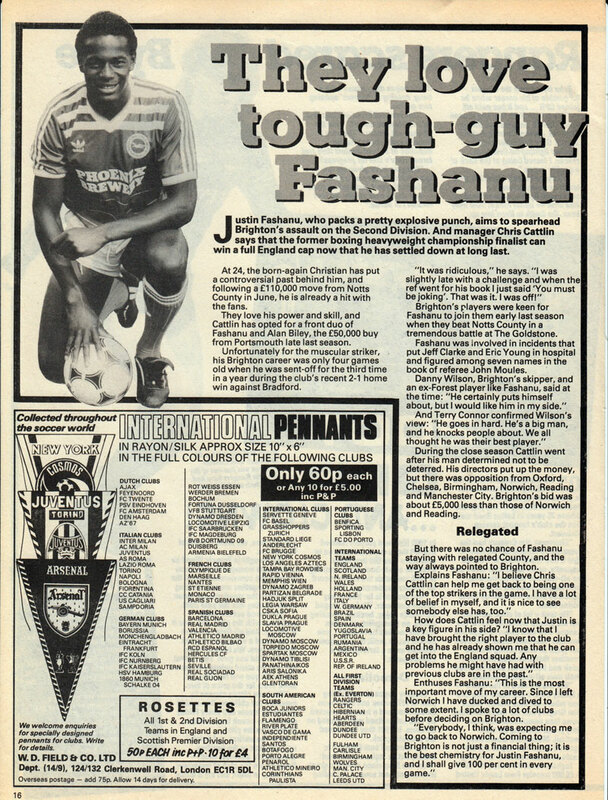 Brighton’s players were keen for Fashanu to join them early last season when they beat Notts County in a tremendous battle at The Goldstone. 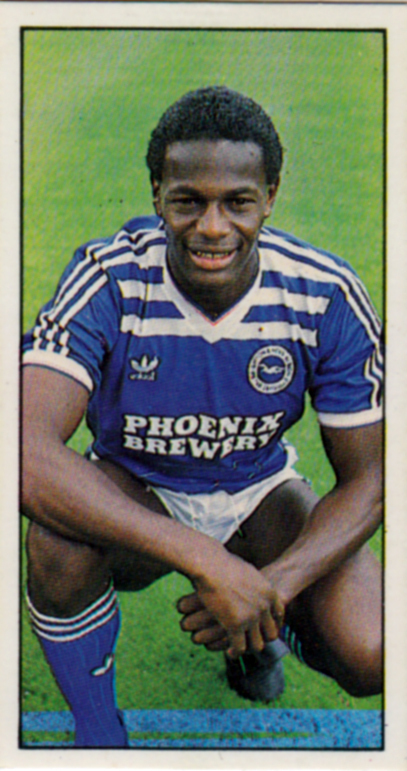 Fashanu was involved in incidents that put Jeff Clarke and Eric Young in hospital and figured among seven names in the book of referee John Moules.